Adding a sparkle and shine to the holiday season with it's inviting and sophisticated look, this fresh flower bouquet is a gift of beauty they will adore. 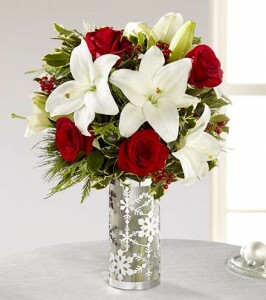 White Asiatic lilies stretch their star-shaped petals across the length of this flower arrangement surrounded by rich red roses, variegated holly, and an assortment of Christmas greens, perfectly matched with an enchanting snowflake inspired glass vase with shimmering silver accents. A great gift for that recipient that loves to make the holiday season sparkle! 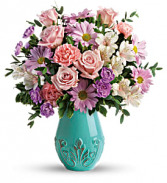 Crème roses, orange spray roses, peach asiatic lilies, light blue iris, and blue sinuata statice are accented with seeded eucalyptus, spiral eucalyptus, and myrtle. Delivered in a Spring Beauty Pitcher. Shower Mom with a garden of love! 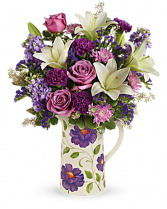 Inspired by classic Provencal style ceramics, this charming pitcher overflows with a luxurious mix of roses, lilies and carnations to brighten her home, and her heart - this Mother's Day and beyond! This garden-inspired bouquet features lavender roses, white asiatic lilies, purple carnations, lavender stock, lavender cushion spray chrysanthemums, lavender sinuata statice, seeded eucalyptus and variegated pittosporum. 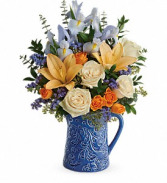 Delivered in Teleflora's exclusive Garden Pitcher.